On the last day of March we resumed our fieldwork. The chosen place was the site of the Great Aten Temple, that lies immediately beside the modern cemetery of the village of El-Till. A large part of the temple foundations was excavated by John Pendlebury for the Egypt Exploration Society in 1932, and a report of the findings, both the architecture and the objects, was included in the volume, City of Akhenaten III, published in 1951. The reason why it has found a place on our agenda is that the village cemetery is steadily expanding and threatens to encroach upon what little is left of the ancient building. Our aim is to make a fresh record of what survives and then to proceed to protect the remains, in part by reburial and in part by marking the principal wall lines and features in new materials, principally limestone blocks. Only in this way will the site gain sufficient respect to escape further losses. The site is a large one and the project will take several years to accomplish. The result should be, however, of great interest to visitors, who will be able to see the scale of Akhenaten’s building and its extraordinary layout, that included hundreds of offering-tables set out in rows in long open courts. The Ministry of Antiquities was represented by inspectors Mohammed Wahaballah Abdelaziz and Shimaa Sobhy Omar. The archaeological team comprised Mary Shepperson and Marsha Hill at the stela site, and Miriam Bertram, Delphine Driaux and Anna Hodgkinson at the temple entrance. The first week was spent in removing quantities of village rubbish that had come to cover the front of the temple, that lies beside the asphalt road that links the villages of El-Till and El-Hagg Qandil and is all too convenient an open space for dumping. The re-excavation began on April 7th and ended on May 17th. 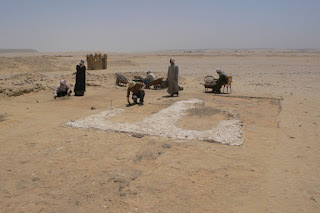 On the 20th, our building team took over and began the combined task of reburial and marking out the wall lines. Their last day was June 10th. The main temple occupies only a small part of a huge enclosure that is marked by the line of a brick wall that runs back for 800 metres (Figure 1). Almost lost in the distance, and largely hidden by modern tomb enclosures, are other parts of the temple. They include the place where fragments of a purple quartzite stela bearing an extensive list of offerings have been found in the past, as well as fragments of what was probably a statue of Akhenaten. We made this place, too, an object of fresh investigation. From Pendlebury’s plan we learn that the front of the temple included a pair of mud-brick pylons and several structures immediately inside that preceded the principal stone building. One of these he labelled the ‘Altar’. Little of this was visible when we began, being buried beneath spoil heaps and deposits of dust, sand, rubbish and animal manure that had accumulated since 1932. The removal of these deposits revealed that much of what Pendlebury saw in this part is still present and not much changed. We concentrated our work on the northern of the two pylons and the northern half of the entrance between them, and on the ‘Altar’, an impressive set of foundations made from gypsum concrete for a stone building that contained a columned hall and so is unlikely actually to have been an altar. By the end of the re-excavation the ‘Altar’ foundations lay completely exposed, as did the brick threshold between the pylons, but only a small part of the north pylon itself was visible (Figure 2). The large Pendlebury dump that lies on top had to be removed as a conventional piece of excavation, with all the spoil passed through sieves, and this was a slow process. In view of the number of pieces of broken sculpture and inlay fragments that we recovered (Figure 3), it is a justifiable procedure, but half of the spoil heap still remains to be removed. Pendlebury had determined that this part of the temple had seen more than one major alteration in its layout, the pylon belonging to a later and grander phase. Our own re-clearance around the pylon has shed more light on this process of enlargement. The purpose of the building remains uncertain. In three of the pictures of the House of the Aten in tombs at Amarna (two in the tomb of Meryra, one in the tomb of Panehsy), seemingly just inside the outer entrance to the temple, stands a separate building (shown duplicated in the case of one of the Meryra scenes). The details differ in each case. The Panehsy version gives prominence to a throne, whilst one of the Meryra versions includes a Window of Appearance. It looks, therefore, like a tiny palace, something needed everywhere that the king visited. The last three weeks of the season were devoted to making the outline of the building permanently visible. By the time the excavation finished, the gypsum foundations of the building were exposed, covering a rectangle measuring c. 14 x 25 m. The foundations had varying depths, reflecting the downward slope of the ground towards the south. This created a common level for the tops of the foundations, except for the part north of the columned hall, that was 20 cm lower. One possible course of action was to bury the entire construction in sand and leave it otherwise unmarked. This is likely, however, to have perpetuated the impression that the site does not deserve the respect to which it should be due and, in the longer term, to have encouraged further encroachment on the temple precinct. I therefore adopted the plan to build the foundations up to a common level and then to lay over it a single course of blocks that would reproduce the foundation plan. All intervening spaces would be filled with sand and, eventually, the front part would be likewise buried in the sand fill that is needed to recreate the ground level of the temple in its final phase. I engaged a team of builders from El-Till who have done this kind of work for us before. Using new limestone blocks laid over a bed of sand that separates them from the ancient foundations a new foundation layer has been laid over all except the rear two strips of gypsum foundations (Figure 4). These and other exposed ancient surfaces have been protected with sand. The final step when we resume will be to lay a single course of new stones over all wall lines, and to recreate in the same course the column foundation pattern. All intervening spaces will then be filled with sand, leaving a low platform, one block in height, over which the plan of the building will be unobtrusively visible. 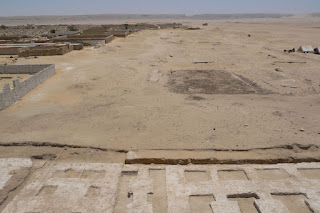 The stele site stands in front of the sanctuary of the Great Aten Temple, south-east of the modern cemetery. The site was excavated in the 1930s by the Egypt Exploration Society under John Pendlebury, who found a large T-shaped depression to the north-west of the entrance to the sanctuary. The EES expedition excavated within this depression down to gypsum plaster foundations about 50cm below the surface level. It was concluded that this was the foundation for a stone platform, which held a large round-topped stele depicted in Amarna tomb reliefs. This season, the stele depression was re-excavated so that these foundations could be recorded. In addition, the area around the edges of the depression, enclosing an area of 25m x 25m, was excavated in order to gain further evidence for the use of this area within the temple. A further aim was the recovery of fragments of the stele, which was made from a distinctive purple quartzite, in order to add to what is known of the stele from fragments already held by the Metropolitan Museum of Art in New York. The excavation has revealed two phases of architecture (Figure 5, Figure 6): an early phase (Phase 1), consisting of a small mud-brick platform surrounded by large posts and other ephemeral architecture, followed by the main temple phase (Phase 2), for which the architecture of Phase 1 was levelled and replaced with a stone platform sunk into a foundation pit. A rectangular mud-brick foundation (6.30m x 4.50m) lies on the eastern side of the stele depression, with the remains of two brick bases on its northern side; probably marking the end of a short staircase up to the mud-brick platform. An area of hard-packed floor surface survives at what would have been the foot of these stairs. Deep, narrow pits were found forming three sides of a rectangle surrounding this mud-brick platform. Two pits flanked the end of the staircase. The dimensions of these pits, which were filled with occupation and mud-brick debris, suggest that they probably held tall wooden posts or flag poles. On the western side of the stele depression, the eroded desert surface was found to be cut by many small features. These include a shallow N-S ditch, circular depressions to hold vessels, and a large number of small pits and post-holes. This area appears to have had a number of uses, probably concerned with the preparation and dedication of offerings, and to have been the site of small-scale wooden architecture, such as fencing, shades or screens. On both the eastern and western sides of the stele depression, the Phase 1 architecture appears to have been levelled. The mud-brick platform was destroyed down to the last course of bricks, the deep post pits were filled up with mud-brick debris, and the small pits, ditches and emplacements seem to have been deliberately packed full of mud material: the ground was prepared for the Phase 2 architecture. A large rectangular depression was dug with a narrower extension on the south side to form a T-shape. At the bottom of this, traces of gypsum-plaster foundation were found around the edges. The foundation appears to have been wider than its preserved extent, but much has been lost when the blocks were removed, and more destroyed by the EES excavations. Block impressions suggest a large platform of limestone blocks was built in the depression, with the southern extension representing a staircase leading to the top of this. On top of the construction debris from this platform, a rectangle of mud-brick paving was laid to the north, looking towards the Northern Entrance Pavilion that straddles the temple enclosure wall. Mud plaster was used to level the area to the south and west in preparation for a gypsum plaster floor, a fragment of which survives south of the staircase foundation. 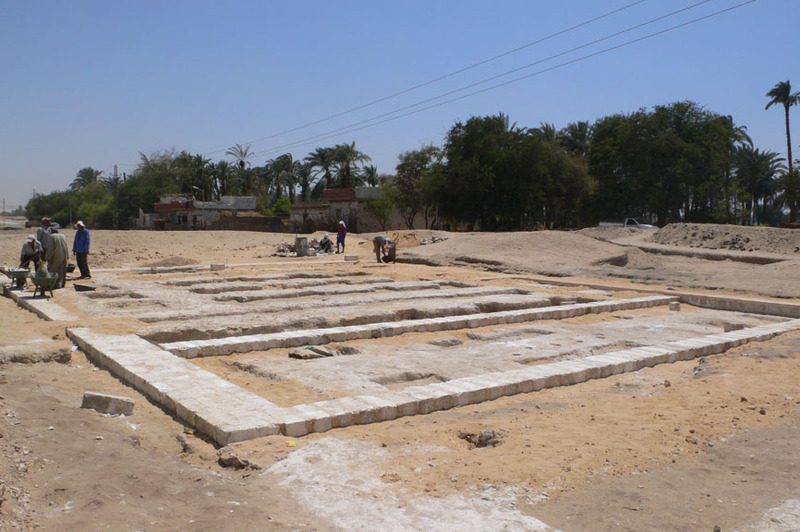 Finally, a rectangular gypsum plaster foundation was built to the south-west of the main platform, probably to hold a seated statue of the king. The cut for this foundation truncated the Phase 1 features below. One of the aims of this season was the collection of fragments of the stele which sat on top of the Phase 2 stone platform. All fragments of purple quartzite within the excavation area were examined and those with worked faces were retained for future study. Many small inscribed fragments were recovered; generally these had small hieroglyphs in registers, as seen on the larger fragments held by the Metropolitan Museum, but some figurative elements were also found, including a very small fragment with a carved eye, possibly of a royal princess. Small fragments of a diorite statue were also found. Incense was a common find on site, and fragments were found in almost all the ditches, pits and post-holes of Phase 1. Some was in a raw form as lumps, but it was more commonly found in a processed form as tiny curving rods resembling red glass. In general, very few finds were recovered from the excavated material, indicating that the stele area of the temple was largely kept clear of rubbish and debris. During the same period, the expedition house played to host to visiting scholars and to the annual anthropology field school from the University of Arkansas. Alan Clapham completed his study of the plant remains from the Stone Village excavations, now the subject of a major publication that we hope will go to press during the summer. Willeke Wendrich returned to continue her study of basketry and matting from the excavations, examining the material used to make the cheap mat-like coffins in the cemetery. Rainer Gerisch, in addition to looking at further charcoal samples, surveyed the remarkable new growth of plants in the desert wadis that had been brought to life following the heavy rains of last year. Alexandra Winkels began a study, including microscopic examination, of the gypsum that was widely used at Amarna, especially in architectural foundations. Marc Gabolde copied and transcribed a large group of hieratic dockets, many from the Central City. 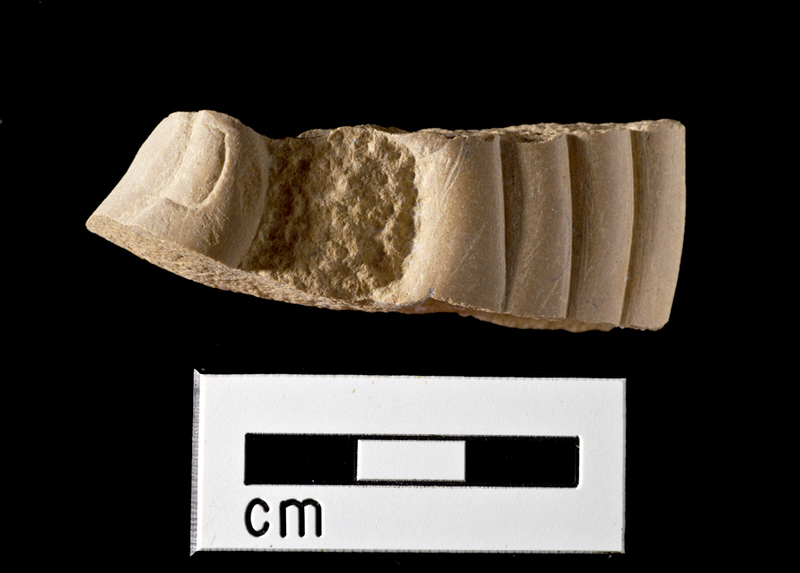 His colleague at Montpellier University, Jean-Pierre Patznick, began a study of small stamped clay sealings and the clay seal impressions on jar stoppers from various parts of the site. Kristin Thompson and Marsha Hill made further additions to the catalogue of sculpture fragments, concentrating on the new material from Great Aten Temple but also including revisions to the existing catalogue of material made in earlier seasons. The University of Arkansas field school, led by Jerry Rose, processed a further 41 skeletal individuals. The now familiar sombre picture of life at Amarna emerged again, marked by high mortality amongst the young and frequent healed fractures and signs of metabolic problems. As an extension to the study of the human remains, Jolanda Bos made an initial assessment of what should be done with the many samples of human hair that have been recovered from the cemetery. One of her preliminary observations is that the ‘fat cones’, of which a likely example was found in 2010, might not have been uncommon in the graves. A significant development in the general way that the expedition runs is the increasing involvement of personnel from the Egyptian Ministry of Antiquities. Some are local inspectors who attend field training sessions, but we were also able to invite to the anthropology field school three Egyptian bone specialists. For the most recent work we received generous support from the Amarna Trust and its supporters, from the Amarna Research Foundation and from the Metropolitan Museum of Art, Egyptian Art Department. But we are now undertaking a considerable spread of work at Amarna, involving longer periods of time at the site. We have an extensive programme planned for the autumn, that will see a further two months of excavation at the South Tombs Cemetery. To help us to carry it through, I greatly hope that you will continue to support us. Figure 1, along the temple axis, viewed to the east. At the bottom is the edge of the gypsum concrete foundations for the Platform Building, Pendlebury’s ‘Altar’. The ground between here and the southwards extension of the modern cemetery is occupied by the barely visible foundations of the Long Temple, the main part of the House of the Aten and originally filled with offering tables. The site of the stela excavations lies beyond the modern tombs. Figure 2, pylon and platform building, viewed to the north. At the left edge can be seen the partially removed Pendlebury spoil heap that lies over the remains of the mud-brick pylon. The electricity pylon stands closely beside it. Figure 3, quartzite inlay fragment, no. S 7531, recovered from the old spoil heaps. It probably belongs to the hand at the end of an Aten ray. Photo by Gwil Owen. Figure 4, marking the outlines of the Platform Building at the end of the season, viewed to the south. The aim is to build the foundations back up to a common level with new blocks laid over a thin bed of sand. The final step will be to lay over these a second layer that represents the original plan and then to fill the intervening spaces with sand. Figure 5, the stela site, viewed to the south. Archaeologist Mary Shepperson cleans sand from the gypsum foundations for a rectangular pedestal, exposing at the same time ephemeral traces of an earlier phase of pits and mud structures. 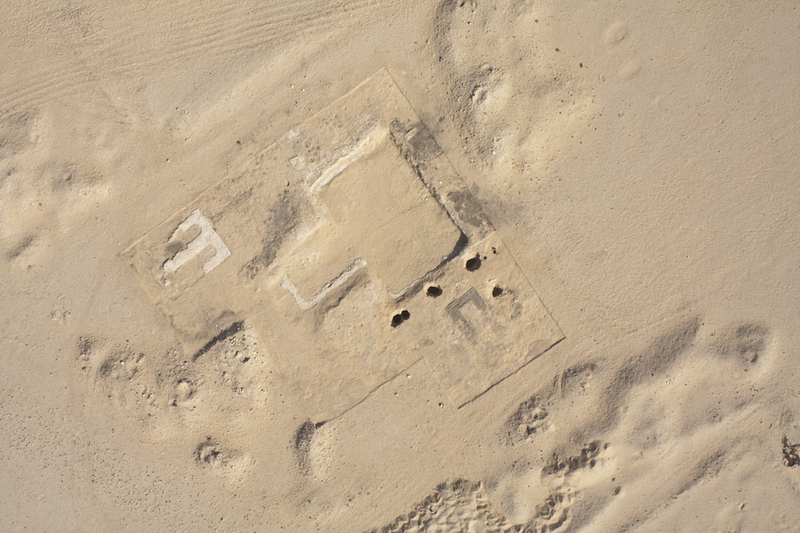 Figure 6, aerial view of the stela site, north being towards the top right corner. Beside the T-shaped foundation for the stela is an earlier mud-brick base surrounded by deep post-holes, not all of them yet excavated. Photo by Gwil Owen. The work at Amarna is supported directly by two institutions: in the UK by the Amarna Trust, and in the USA by the Amarna Research Foundation. In both cases, donations are tax deductible. The Trust sends out a free newsletter twice a year, Horizon, to anyone who sends me a postal address. It is also available as a downloadable pdf file from our two web sites. The Amarna Research Foundation, Inc. is a nonprofit 501(c)(3) organization incorporated under the laws of the State of Colorado. It has been approved by the Internal Revenue Service as a charitable organization, and contributions to the Foundation are tax exempt. The Foundation receives donations and runs a membership list. 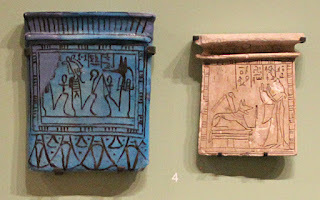 See www.museum-tours.com/amarna/ where a membership form can be downloaded. The Foundation publishes a regular newsletter, The Akhetaten Sun, available to members. The archaeological committee of the central administration for confiscated antiquities, led by Youssef Khalifa, verified the authenticity of a collection of ancient Egyptian objects that were found in the possession of three people in Giza. 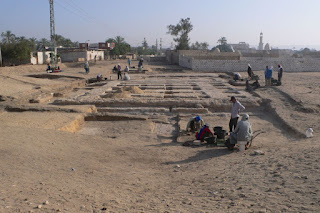 The Tourism and Antiquities Police (TAP) was conducting its routine work to search for artefacts that were reported missing from several archaeological sites in Egypt in the aftermath of Egypt’s 2011 revolution. When the police caught the people with the objects, the TAP called the Ministry of State for Antiquities (MSA) to inspect them and check on their authenticity. Originally published on the Live Science site, but there were problems with the link. Carolyn Graves-Brown, a curator at the Egypt Centre, discovered the artifact in the collection of Woking College, the equivalent of a high school for juniors and seniors. The college has more than 50 little-studied Egyptian artifacts, which were recently lent to the Egypt Centre at Swansea University where they are being studied and documented. On January 25, 2011, tens of thousands of protestors flooded Cairo’s Tahrir Square, demanding the end of President Hosni Mubarak’s regime. As the “day of revolt” filled the streets of Cairo and other cities with tear gas and flying stones, a team of archaeologists led by Susanne Bickel of the University of Basel in Switzerland was about to make one of the most significant discoveries in the Valley of the Kings in almost a century. The valley lies on the west bank of the Nile, opposite what was once Egypt’s spiritual center—the city of Thebes, now known as Luxor. 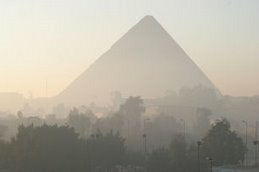 The valley was the final resting place of the pharaohs and aristocracy beginning in the New Kingdom period (1539–1069 B.C. ), when Egyptian wealth and power were at a high point. Dozens of tombs were cut into the valley’s walls, but most of them were eventually looted. It was in this place that the Basel team came across what they initially believed to be an unremarkable find. Not archaeology, but relevant to the general heritage management situation in Egypt at the moment. The two granite islands abound with 125 species of birds, 120 species of flora, and the combined area has been named an Important Bird Area of Egypt and a tentative UNESCO world heritage site. Its six species of acacia are remnants of the gallery forest that is said to have covered the Nile Valley before the introduction of farming thousands of years ago. After the initial confrontation with the EEAA back in early 2011, the trespassers stayed. For more than 12 months, the molokhia put down roots. It was a delicate situation. The EEAA feared that if one family was successful in defying state power, others would follow with their own claims. Three months after the theft of two pieces of a 19th-century embroidered Al-Kaaba Kiswa (the Kaaba cover) from the mausoleum of Khedive Tawfik in Cairo's eastern cemetery, the Ministry of Religious Endowments (Awkaf) decided to hand the other exhibited pieces over to the Ministry of State for Antiquities. These pieces are embroidered with calligraphy in gold and silver thread, similar to those that were traditionally sent by the Egyptian monarchy to cover the Kaaba in Saudi Arabia. They currently hang on the walls of the mausoleum. Antiquities State Minister Mohamed Ibrahim told Ahram Online that although these pieces were not registered on Egypt’s list of antiquities, the antiquities ministry had agreed to receive them, per the request of Religious Endowments Minister Mohamed El-Qousi. Such masks appear to have been created by coating the linen wrappings on the head of a mummy with plaster. So, while it’s not a “death mask” in the modern Western sense of the term, it was meant to portray the deceased. 948.34.41, Seated Isis, was brought to conservation in 1994 for examination and cleaning. It was clear that the head had been over-cleaned and the body was over-restored. The previous restoration had left the sculpture reclining, incorrectly, on a modern throne. Horus, as a young boy, would have sat across her lap, but he is missing. My job was to improve the appearance of the object in preparation for display. The first step was to remove all previous restoration to assess how much of the original existed and its condition. There were some spots of active corrosion, bronze disease, on the back of the head. We would look for the original patina or surface, a corrosion pseudomorph, representing the original surface of the object. Much of the body required cleaning to remove surface repairs and filler; then, corrosion overburden to reveal detail and shape. More than 7,000 years ago, prehistoric people in the African Sahara were making dairy products, such as butter, yogurt and cheese. The discovery, based on the identification of dairy fats on ancient pottery shards found in Libya, is the first to provide a definitive date for early dairy farming in Africa. Adding to findings from Europe and the Middle East, the study points to milk products as a main reason why people in many places may have chosen to give up the hunter-gatherer lifestyle in favor of a more settled existence. Plenty of research has documented the domestication of sheep, goats and cattle, as well as the use of dairy products, beginning around 9,000 years ago in parts of modern-day Turkey, 8,000 years ago in eastern Europe and 6,000 years ago in Britain. In Africa, details have been murkier. Swansea University’s Egypt Centre is the first museum in Britain to have its whole collection go online on the Culture Grid - a searchable database for museum collections, using Modes Complete. The Egypt Centre is the first UK institution to use the latest Modes Complete Collections Management software to connect to the Collections Trust’s Culture Grid and joins hundreds of other UK organisations who are sharing their collections through the Grid, amounting to approximately 2 million records. Since the Egypt Centre opened in 1998 it has always intended to make its catalogue as widely available as possible, but its smaller collection was not well known and often ignored by scholars of Egyptian antiquity. Its aim was to be part of a larger network, but as a small museum with limited resources getting the collection online and integrating it with a larger database seemed impossible. However with the development of Modes for Windows and now Modes Complete and Culture Grid all that has been made possible. Curator of the Egypt Centre Carolyn Graves-Brown says: “In March we purchased the Modes Complete package with the help of a grant from CyMAL: Museums, Archives and Libraries Wales, and with the help of Modes and the Collections Trust we have put all of our collection onto the Culture Grid for wider access”. Dr Graves-Brown concludes: “As a curator with little knowledge of computers, I was genuinely amazed at how easy it has been to upload our collection onto the Culture Grid. I am hoping the rest of the museum world puts their collections online as I am convinced that this is the way forward. To sum up my feelings - at last!”. Welcoming this latest development, Collection Trust’s CEO Nick Poole states: “This link-up between Modes and the Culture Grid leads the way for increased integration of UK collections online and a greater online profile for the collections sector as a whole”. What is the main aim of a museum website? Browsing the internet, you quickly conclude that this is to promote the institution to potential visitors. This is of course a worthwhile aim, museums would not exist without an audience, but I believe that museum websites can be much more. The starting point for all digital activities within a museum should be it’s mission, this is likely to be to educate, to inspire, to preserve and to share (or similar). Visitor figures have a role in a museum, but these should be a way to measure how many people we are reaching, not the reason that the institution exists. The solution I believe is for museum websites to become hubs for ideas, publishing platforms which allow institutions to pursue their missions by sharing knowledge and inspiration with the public. Walker Art Center recently did this, becoming a digital hub for not just contemporary art which is hanging in their institution, but for contemporary art as a whole. The result was a 40% increase in traffic to their website and a digital experience which seems to ties in more closely with their mission. For the Walker Art Center website to grow beyond being primarily a marketing tool they had to invest in the team who produce their website, adding members of staff to manage and produce the huge quantity content needed to keep this ideas hub constantly changing. 1. P. Oxy. 1256: List of priests under age. 2. P. Oxy. 1265: Affidavit of priestly rank. 3. P. Oxy. 1300: Letter of Peter. 4. P. Oxy. 1351: Leviticus xxvii. This morning Wendy (assistant curator), Ros (museum assistant) and Ashleigh (volunteer manager) are off to the annual award ceremony for Children’s University and I am left holding the fort. Hopefully our volunteers will be getting lots of awards. For many years now the Egypt Centre has been running a volunteer programme for children (started by Wendy Goodridge). In 2005 Wendy, and the then volunteer manager, Stuart Williams, came back from a meeting in England (as far as I remember) about a wonderful project called ‘Children’s University’. Children were accredited for voluntary work, not just in museums but also church groups, dance groups, in fact any out-of -chool activities. Could they do the same in the Egypt Centre? To be honest I was a bit worried about the workload, but they talked me round. After all, they said, many of the modules were already set up, we could offer a whole degree in Egyptology for kids. Wendy contacted the Local Education Authority and told them about the wonderful plan. Children’s University Swansea was born. Cracking the Egyptian Code, By Andrew Robinson. Oxford. On Sept. 14, 1822, as legend tells the tale, Jean-François Champollion burst into his brother's Paris office at the Academy of Inscriptions and Belles-Lettres, flung a bundle of drawings upon the desk and cried, "Je tiens mon affaire!" ("I've done it!"). Champollion promptly fainted before he could utter news of the great intellectual feat for which he is still celebrated: the decipherment of ancient Egyptian hieroglyphs. The story of the young, frail, hotheaded scholar and his volatile time, full of upheavals political and scientific, is a remarkable tale, wonderfully told in Andrew Robinson's "Cracking the Egyptian Code: The Revolutionary Life of Jean-François Champollion." The founding father of Egyptology started young and lived a relatively short life. Born in 1790 in southwest France, Champollion became fascinated by Oriental history and languages not long after he was sent to school in Grenoble at age 10, having exhausted local teachers. Nice article about the new, fourth edition of Who Was Who, with some good photos and a short video including a time-lapse portrait of the Editor, Dr Morris Bierbrier, at work during the preparation of the new edition and a selection of the newly added photos. I have my copy of the book on pre-order! The Editor, Dr Morris Bierbrier, has become a fixture at Doughty Mews over the last couple of years, adding a vast amount of new information, many entirely new entries, and significantly more photographs. The new volume is exactly 600 pages long - a substantial increase on the last edition. Having been responsible for the production editing (and hence the volume’s appearance a little later than originally planned - see below) I am absolutely delighted that Morris’ efforts are finally coming to fruition, and had a bit of fun producing the short film below in celebration.. . . When I first proposed the new edition to the board of Trustees in 2008 we were trying to reduce costs in all areas in response to the withdrawal of the British Academy grant (see below). The Board agreed to go ahead however on the basis that print costs would be recovered through sales, which we felt were likely to be good - as I hope turns out to be the case! - and that production costs would be minimal, as I would scan all the images and set the volume to page myself in my spare time. This is the kind of thing I enjoy doing(!) and the scanning and consequent creation of a digital archive of Egyptologists’ portraits was very much in-line with our existing digitisation work, and potentially of great use. The only downside to this arrangement was that, in the event, it was difficult for me to find as much spare time as I had hoped I would to do all this (perhaps predictably). This has led to the volume appearing later than I had originally hoped (see this announcement from 2008) but I like to think it will be well worth the wait nonetheless! The event was also well covered by Campbell Price, who also clearly enjoyed the day considerably. See his post on the Egypt At The Manchester Museum blog. Volume 47, Issue 2, 2012. All articles available for purchase, but abstracts are free to view. How art begins is one of mankind’s greatest enigmas to which an answer has yet to be found. If there is any hope of discovering the process out of which it emerges, ancient Egypt might be the place that will yield some clues. The admirable show, “Dawn of Egyptian Art,” put together at the Metropolitan Museum of Art by Diana Craig Patch, reveals a world of seething artistic creation headed in multiple directions. Much of it bears no recognizable connection to the statuary and objects from Egypt under its historic dynasties. All three trends are occasionally observed side by side on a single object. If the Roman Empire had entirely succeeded in its plans to rid Egypt of all things Cleopatra, the California Science Center would have an entirely different display in its third floor exhibition space. A myth that has served as the story lines of many a film, novel, and stage production would have remained just that: a myth. Alas, about 150 pieces of Egyptian artifacts “illuminating the life of Cleopatra VII” fill this very space of iconic museum a few miles south of the downtown Los Angeles skyline. For the next few weeks, patrons will view large statues and little statuettes, illuminating jewelry, once-valuable coins, and elaborately handwritten notes that were once housed in Cleopatra’s lost palace in Alexandria. Featuring eight galleries, a four-minute movie, and an IMAX experience, "Cleopatra: The Search For The Last Queen Of Egypt" elaborately connects viewers with a big slice of infatuated and nostalgic history, one that preceded us by several centuries yet has lived mightily through countless tales of an enigmatically fascinating woman. Visitors to the University of Michigan Hatcher Graduate Library will get a peak into the past through a papyrus exhibit called "Orality and Literacy in Greek and Roman Egypt." The exhibit showcases ancient Egypt's written and spoken word through the university's papyrus collection. It includes writings from people of all different classes and literacy abilities. Arthur Verhoogt is the acting archivist of the U-M papyrology collection and is overseeing the exhibit. The items in the exhibit help the viewer gain an understanding of the lives of these ancient people. "Studying these ancient writing provides us with a window looking on the ancient world," he said. "By contrasting and comparing things that happened then, we may understand similar processes at work in our own society better." Building on work carried out at the Petrie Museum of Egyptian Archaeology in London. In a two part feature, Tonya Nelson defines and expands on the the idea of ‘viral capacity building’ – the acquisition of knowledge and expertise through person-to-person transfer - in light of the use of 3D technologies in museums and galleries. The imperative to use digital technologies to engage the public and improve back office operations is higher than ever. Recognizing this, major UK cultural funding agencies such as NESTA, Heritage Lottery Fund and Arts Council have, or soon will be, launching major funding calls for new digital projects. I welcome this support, but wonder what the best model for deploying this funding is if we seek to sustain innovation in the sector. In its recent funding call, NESTA asked cultural organizations to partner with commercial sector technology companies to develop digital projects over 1 year period for an amount between £50,000 –£100,000. 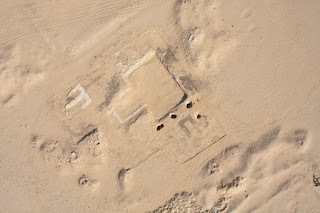 Sarah Parcak uses satellite imagery to discover ancient, previously unknown archeological sites. Sarah Parcak is an archaeologist and Egyptologist, and specializes in making the invisible past visible using 21st-century satellite technology. On 2 June 2012 at the annual Saqqara Day of the Friends of Saqqara Foundation in Leiden, Professor Geoffrey Martin was presented with the first copy of the latest Excavation Memoir published by the Egypt Exploration Society - The Tomb of Maya and Meryt I. A report on the day can be found here and this short video records the actual presentation to Geoffrey Martin. The fourth edition of Who Was in Egyptology will be available from June 2012. This short clip includes a selection of newly added photos and a time-lapse portrait of the Editor, Dr Morris Bierbrier, at work during the preparation of the new edition. In 2012 a project to re-house thousands of glass negatives taken at the temple of Sety I at Abydos and at Tell El-Amarna, in the 1920s and 30s, was completed. The work was funded by the generous contributions of EES members. Further information can be found here. Earlier videos of our fieldwork, archival projects and events are also still available on our YouTube channel. Piece by exhibition curator Emily Teeter on Picturing The Past: Imaging and Imagining the Ancient Middle East (Feb 6 to September 2 2012) at the Oriental Institute, in the Oriental Institute News and Notes No.212 Winter 2012. It's a PDF. It wouldn't open in Firefox but was fine in Google Chrome. Abstract: The present study, with its concentration on the diffusion of Sarapis names, is intended to demonstrate how onomastic data, collected in computerised databases, can be useful in different ways. It took a long time before parents were prepared to give children Sarapis names, and the majority (85%) were derivations (e.g. Sarapion, Sarapias) rather than full theophoric names (e.g Sarapadoros, Sarapammon), which occur only in Roman times. Some names like Sarapous and Sarapas are geographically limited, and a local martyr cult preseves the popularity of Sarapion and Sarapammon into the Christian period in Middle Egypt. The refinement of the statistical method may lead to wider and different questions. Nice write-up of a talk around some of London's Egyptianized buildings, with some good pics. Yesterday I attended a walk organised by the Petrie Museum entitled 'Cinematic Necropolis', intended to explore Egyptianising monuments in North-East London. Being a newcomer to the city, and indeed to the Islington area, this seemed the perfect opportunity to combine local sightseeing with an interest in Egyptian-style architecture. Despite the threat of rain the group gradually assembled at the Carlton Cinema on Essex Road, Islington, which was the first stop on the walk. Some lovely photographs of Dakhleh Oasis, the Gilf Kebir and other Western Desert locations. The photographs are highly saturated and the contrast is very high, so these are more art than nature, but they are no less beautiful for that. Many thanks to Yvonne Buskens for sending me the link. The Luxor Criminal Court on Tuesday sentenced in absentia six people to life imprisonment and five others to 10 years in prison for armed robbery of the antiquity storage area belonging to the German mission in Luxor and the theft of two ancient statues. On 19 March of last year, an armed group attacked the stores of the mission in Qurna, west of Luxor, wounded three guards, smashed the doors and stole an ancient Egyptian statue made of black granite and another of Sekhmet, the ancient Egyptian goddess of war. According to the state-owned MENA news agency, a military court had sentenced the 10 defendants, including five at large, to a prison sentence of 25 years. At the turn of 2011/2012, Polish scientists secured medieval paintings in the so-called Raphelion, or religious buildings dedicated to the Archangel Raphael in Banganarti, Sudan. This unique church building from mid-eleventh century was an important pilgrimage centre of in the Christian kingdom Makurii until mid-fourteenth century. Necessary conservation work was possible wilt financial support of PKN Orlen. "In addition to conservation, we have also performed restoration and protection work. W stabilised substrate layers, exterminated insects feeding in the layer of plaster, and cleaned and preserved the colour scheme of the most important paintings" - said Dr. Bogdan T. Żurawski from the Department of African Cultures of the Institute of Mediterranean and Oriental Cultures PAS, head of research. Work in Banganarti is conducted under a concession of the Centre of Mediterranean Archaeology of the University of Warsaw. Moreover, in the chapel of the holy healers Cosma and Damian, using the strip belt method (not destroying the inscriptions on the walls) Polish conservators unveiled earlier paintings. This allowed Nubian wall painting experts to look at the previously covered iconographic themes. 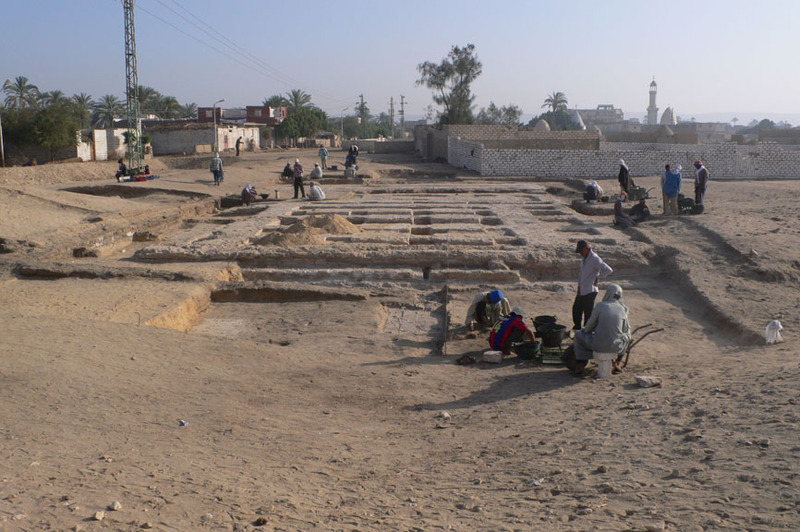 The combination of detailed excavation, archaeological survey, and geomorphological analysis in and around Dayr al-Barsha was vigorously pursued in 2012. This led to several new insights that are crucial to understand the archaeology in the region as a whole. One of the best-loved objects in the vast British Museum collection, a small bronze cat with its tail sedately wrapped around its feet and wearing golden rings in its ears and nose, is off on a journey its creator could never have dreamed of in Egypt 2,500 years ago – to Lerwick in Shetland. The cat is one of a series of spectacular artefacts that the museum is sending out on loan to regional museums. The lucky recipients, many pummelled by local authority and other funding cuts, will not have to pay a penny towards their distinguished visitors. The British museum is funding the loans through £100,000 from the Art Fund museum prize, which it won last year for the phenomenally successful Radio 4 series and exhibition A History of the World in 100 Objects. The museum's director, Neil MacGregor, said there were good geographical reasons for some of the loans: the 13,000-year-old carved ivory tusk of a swimming reindeer is going to Creswell Crags in Derbyshire, where ice age inhabitants were making art in the same period, and the Mildenhall Great Dish is going to Ipswich, near the site where it was excavated. But others had no justification other than sending something wonderful where it had never before been seen. Antiquities Minister Mohamed Ibrahim discussed with a German cultural delegation on 10/6/2012 means of reactivating a 1998 twin ship agreement between the Germany's Hildesheim museum and the Atuni Museum in the Upper Egyptian city of Minya. Talks covered accelerating work to complete the still unfinished stages of the Atuni Museum project, mainly those connected with the display design and the setting up of the museum's data base. On the Nile bank of Minya stands the pyramid-shaped building of the Aten Museum, waiting for the completion of its final phase, in order that it may welcome visitors next year. The museum was designed by the German government as a gift for the Egyptian government in 1998, according to the partnership between the Aten Museum and the Hildesheim Museum in Germany. The building was modified by late architect Gamal Bakry, and museum consultant Mahmoud Mabrouk designed the grounds to provide a suitable landscape for outdoor exhibitions. The museum grounds, which overlook the Nile, take up 25 feddans. The building is made up of five floors and features 14 exhibition halls, a large conference hall, and a school of museum and restoration studies. An open air theatre in the grounds displays a collection of ancient Egyptian replicas. In the early part of the 20th century, the world experienced tumultuous change. At the turn of the century, advances in technology linked humans around the world like never before, political borders changed in the aftermath of one of the deadliest wars known, and the world began to settle into a period of prosperity. In the Valley of the Kings, the early part of the 1920’s brought immeasurable fame with the discovery of the tomb of Tutankhamun. Howard Carter’s opening of a nearly intact tomb in 1922 revived the popular appeal of ancient Egypt and the history it contained. However, with this fame came notoriety; within four months, Lord Carnarvon, one of the benefactors of the excavations, passed away. News of his death instigated rumors and discussion of a possible curse on the tomb, and subsequent deaths of those involved in the project, whether explained or not, became fodder for curse enthusiasts. Popular depictions of ancient Egypt only added fuel to the fire, with the relationship between ancient Egypt and the occult becoming cemented in the eye of public opinion. Following restoration the Salahed Citadel at Taba (Red Sea) will be opening next month. More details when the Ahram Online website is back up and running! Doctors have long known that a spoonful of sugar helps the medicine go down. But in 'corpse medicine' - the idea of treating ills by swallowing body parts and fluids - a little sweetener wouldn't make a blind bit of difference. First up is Mummy Powder, which was purported to be the ground up remains of the ancient kings of Egypt. This was a popular medicine used from the 12th to the 17th century to cure everything from headaches to stomach ulcers, according to Compiled by 109.com, which compiled the list. Rough Translation: When the warrior Iquer was buried 4,000 years ago, those who interred him could not have imagined that he would be exhibited at the Luxor Museum. But this is what has happened, thanks to the work of the Spanish Project Djehuty, at Dra Abu el-Naga, the Theban necropolis where Jose Manuel Galan's research team has worked more than a decade. The discovery of Dynasty XI coffin (dating to about 2000 BC) was made during the 2008 campaign. Painted red with beautiful polychrome drawings of glyphs, it has since undergone extensive restoration by experts from the Council for Scientific Research (CSIC). Galan says that the only comparable coffin known is one in the Boston Museum, and that it is very well preserved in spite of the presence of large amounts of water in the past. Cuando el guerrero Iquer fue enterrado, hace 4.000 años, sus sepultureros no podían imaginarse que acabara expuesto en el Museo de Luxor. Pero así ha ocurrido, gracias al trabajo de la misión arqueológica española del Proyecto Djehuty, en Dra Abu el-Naga, la necrópolis tebana en la que el equipo de investigación de José Manuel Galán lleva trabajando más de una década. "Sólo se conoce uno similar, que está en el Museo de Boston, pero el nuestro está muy bien conservado pese a que corrió abundante agua por fuera y por dentro", explica Galán, que la semana pasada se trasladó a Luxor para asistir al acto de entrega en el Museo como responsable del yacimiento. This should put the cat amongst the pigeons. Rough Translation: Next December the Neues Museum in Berlin will host a major exhibition to mark the centenary of the discovery of the famous bust of Nefertiti. The exhibition, which will be held between 7th December 2012 and 13th April 2013, will present about 600 objects to provide a historical and cultural context that will provide an approximation to the Amarna period. Many of the objects on display with the bust (which was discovered on December 6th 1912 by archeologist Ludwig Borchardt at Amarna) n Luxor have never been publicly displayed before. El Museo Nuevo de Berlín acogerá en diciembre próximo una gran exposición para recordar el centenario del descubrimiento del famoso busto de la reina egipcia Nefertiti, según un comunicado difundido hoy por los Museos Estatales de la capital alemana. La muestra, que podrá verse entre el 7 de diciembre de 2012 y el 13 de abril de 2013, presentará alrededor de 600 objetos en su "debido contexto histórico-cultural", que permitirá una aproximación a la era de la reina Nefertiti y de su esposo, el gran faraón Akenatón. Junto al busto, descubierto el 6 de diciembre de 1912 por el arqueólogo Ludwig Borchardt en el valle de Amarna, entre Luxor y El Cairo, los visitantes podrán ver muchos otros objetos hallados también entonces y nunca antes exhibidos públicamente, que serán debidamente restaurados. Via the Petrie Museum Unofficial Facebook page. The history of gold is as old as that of man. There is no doubt that it was one of the first metals known to primitive man, as it exists in nature in an elemental state. Its association with primitive cultures is evidenced by the fact that crude ornaments of gold have been found among the remains of all prehistoric peoples. However, the first people to use gold on a considerable scale were the ancient Egyptians. Archaeological evidence reveals that the yellow metal came into fairly extensive use during the predynastic period, that is, before 3100 BCE. It was only with the advent of the early dynastic period, from 3100 BCE onwards, that gold began to be extracted by systematic mining. Some of the earliest mining operations were conducted in the granite mountains east of Coptos and further south, in Nubia, between the Nile and the Red Sea, during the early dynastic age. Via the Collecting Egypt blog, with thanks. Enjoy an innovative museum experience at the Louvre’s Department of Egyptian Antiquities! State-of-the-art, fun-touse multimedia resources, developed for the ‘Louvre – DNP Museum Lab’ project, are available to help you understand the conventions of Egyptian art and decipher a funerary stela: the Stela of Sakherty. In Rooms 21 and 23 (on the 1st floor of the Sully wing), ingenious multimedia devices, purpose-designed for the department, offer an insight into the collection of Egyptian Antiquities, helping you make sense of the exhibits and discover their connection with ancient Egyptian beliefs. With thanks to Geoffrey Tassie for the link. Bioarchaeology of the Near East. Volume 5, 2011, pp. 19-40. 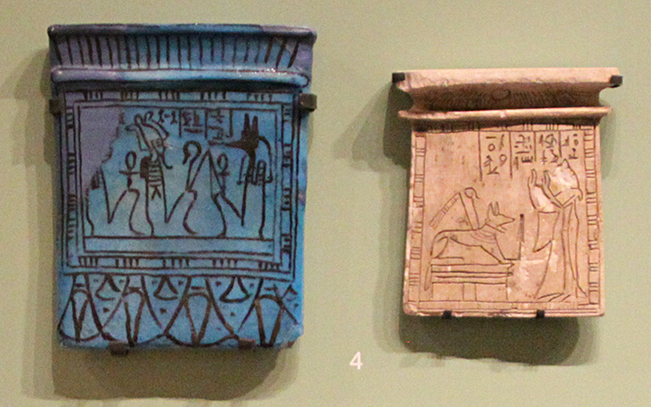 In the Nile Valley, the examination of ancient peoples has generally focused on the similarities and differences between Egyptians and Nubians, both culturally and biologically, as well as on changes over time (e.g., Berry & Berry 1972; Buzon 2006a; Carlson & Van Gerven 1979; Edwards 2004; Geus 1991; Godde 2009; Irish 2005; Smith 2003; Williams 1991). Fewer studies have focused on the biological and cultural affi nities between contemporaneous groups in the region. During the Bronze Age (~3100−1100 BC) several different populations lived in Nubia. In this article, the archaeological evidence (such as burial ritual and pottery styles) used to defi ne the cultures known as C-Group in Lower Nubia (northern region) and Kerma in Upper Nubia (southern region, Figure 1) is surveyed in conjunction with cranial measurements to examine the complex relationship between two groups who lived during this period in ancient Nubia. While both were situated in ancient Nubia during the Bronze Age, how closely were they related? The goal of this study is to investigate the cultural and biological variability in these two Bronze Age Nubian groups, to assess the evidence for group distinction, and to explore the relationship between cultural and biological variables in their ethnic group composition. Informative 40-page PDF with some lovely photographs. Dakhleh, the “inner” of the oases to the West of Luxor is one of the most important Oases of the Western Desert. It has the main important archaeological sites including a town of the Old Kingdom and its associated necropolis, near the modern village of Balat, which show that the Egyptians’ control extended more than 350 km west of the Nile Valley into the Western Desert from a very early period through the Pharaonic to the Greek and Roman periods. It also has a number of important Coptic and Islamic sites. Therefore you can smell the history of Egypt in this wonderful Oasis. Since 1978 Antony J. Mills works on the Dakhleh Oasis Project (DOP). The small exhibition Treasures of the Dakhleh Oasis at the Egyptian Museum, Cairo, is held on the occasion of the Fifth International Conference of the Dakhleh Oasis Project, held 3‐6 June in Cairo. This exhibition importantly reflects the work of Olaf Kaper (Leiden University), Fred Leemhuis (Groningen University) and is supported by the Netherlands‐Flemish Institute in Cairo. We would like to extend our gratitude to them for this very informative exhibition and its beautifully illustrated catalogue. Two page article from The Lancet. 200 years ago this year, the future founder of Egyptology, French linguist and archaeologist Jean-François Champollion (1790–1832)—the fi rst person since classical antiquity to be able to read the ancient Egyptian hieroglyphs—conducted a primitive experiment. It turned out to be one of the initial scientifi c steps on the long road to unravelling the mysteries of mummifi cation, fi rst described in the fi fth century BC by the Greek historian Herodotus. In 1812, Champollion was an impecunious 21-year-old assistant professor of history at the University of Grenoble and an assistant at the city’s municipal library. A teenage prodigy in Oriental languages, he had become obsessed by understanding ancient Egypt, as a result of his schoolboy exposure to fascinating antiquities brought back from Egypt by the scientist and prefect of Grenoble, Joseph Fourier, who accompanied Napoleon Bonaparte’s army on its expedition in 1798–1801. Introduction: When proposing a theme for the Egyptological conference in Helwan, the Arab Republic of Egypt, in May 2005, one of the authors of this article chose at first to talk about the general evolution of Egyptology, with special regard at the gradual decrease of historical studies in it during the 20th century. The thesis he intended to postulate was that this decrease is a great danger to our discipline. When the Egyptologists of the ‘heroic age’ were writing their respective histories of Ancient Egypt1, they were willing to present in them its comprehensive picture reflecting facts as they were known, social conditions and culture of the Egyptian civilization. Now the prevailing trend of Egyptology is the highly specialized studies of language and texts, or religion, or archaeological and artistic artifacts; but these studies, however useful for developing the methods of research, cannot be a value of themselves. They badly want a framework, which would turn each specific achievement of an individual researcher into a piece of an integrate mosaic. Archaeologists and guards at Gabal Al-Silsila archaeological site, 20 kilometres north of Kom Ombo city in Aswan, succeeded in catching a group of thieves who in full view had tried to remove King Meneptah’s stelae from its original position on the wall of his chapel. Minister of State for Antiquities Mohamed Ibrahim said the theft attempt was discovered late last night when permanent archaeologists at the site realised that four people were in front of King Meneptah’s stelae trying to hack it off the wall with an axe and digging tools. With the help of guards, archaeologists surrounded the criminals and caught them red handed. The Tourism and Antiquities Police came and took the criminals into custody. Security guards foiled an attempt to steal an antique panel depicting King Merenptah, the fourth ruler of the 19th Dynasty of Ancient Egypt, in the Selsela mountain quarries 20 kilometers north of Kom Ombo, Aswan. Antiquities Minister Mohamed Ibrahim Ali announced on Wednesday that four people were seen attempting to steal the piece, and were immediately detained by security guards in the area. The tools they used in their excavations were seized, a report of the incident was filed and the four suspects were referred to the prosecution. The tourism and antiquities police were notified of the incident. The minister added that security was tightened in the area and the guards were rewarded for arresting the suspects. The site of the Deir Al-Barsha necropolis in the sandy gravel desert is famous for its rock-hewn tombs dating from the Middle Kingdom. John Hopkins at the Temple of Mut dig diary is back! This is an educational web site that aims to provide the viewer with the elements of archaeological work, including the progress of excavation. The daily results are crucial to an understanding of how field investigation takes place, since decisions must be made on the basis of ongoing work. The people involved in the work are also an essential feature and contribute profoundly to the final outcomes. The focus of our diary is thus often on the people and their activities. In May 2012 Dr. Betsy Bryan returned to the Temple of Mut precinct in Luxor, Egypt with ten Johns Hopkins students: five undergraduate and five graduate. This year Dr. Bryan and her team will be working in the area behind (south of) the lake where between 2002 and 2006 industrial areas for baking, brewing, faience and ceramic production, were discovered. Aislin Lowry is back at Dakhleh with some great tales from the archaeological team there. Almost 16 months after a popular revolt deposed long-standing Egyptian president Hosni Mubarak, presidential palaces have been infested with insects, bats and crows due to closure and a lack of attention. Some of Egypt’s eight palaces were built in the 19th century, according to archaeologists, who call for turning them into tourist sites. Most state institutions have stopped looking after the presidential palaces since Mubarak’s ouster in February last year for fear of being accused by opponents of the former leader as being loyal to him, officials said. “These sites have around 100 rare species of trees, most of them are facing a serious decline due to negligence over the past months,” said an official, who requested anonymity. It's not hyperbole to say that London is home to many of the world's best museums. Venues such as the British Museum, Victoria and Albert Museum, Science Museum and Design Museum can justly lay claim to being the best in their field (and most of them are free too). But with so many world-famous museums dominating the itineraries of tourists and being a first port of call for locals with visitors in tow, it can be easy to overlook London's cornucopia of lesser-known and smaller-scale museums. With that in mind I've rounded up 50 of the best unusual London museums for people looking for alternatives to the big hitters. I've termed them 'unusual' not because their subject matter is quirky or weird - although, sometimes, that's definitely the case - but because they're not typically the usual choice for newer visitors to the city. Found within UCL, the Petrie Museum of Egyptian Archaeology may be small but its collection of some 80,000 objects makes it one of the greatest museums of its type anywhere. With thanks to the Collecting Egypt blog for the link. The University of Richmond Museums presents Ti-Ameny-Net: An Ancient Mummy, An Egyptian Woman, and Modern Science,on view from February 24 to November 16, 2012, in the Lora Robins Gallery of Design from Nature. The exhibition celebrates the life of Ti-Ameny-Net, a woman who lived in Egypt in the 7th century BCE and whose mummy was donated to Richmond College in 1876 by Professor Jabez L. M. Curry. This exhibition features the mummy of Ti-Ameny-Net, her elaborately decorated wooden coffin, and a selection of Egyptian artifacts from the collections of the Stuart L. Wheeler Gallery of the Ancient World, Department of Classical Civilization, University of Richmond, and the Lora Robins Gallery of Design from Nature, University of Richmond Museums. Also on view are images and information based on modern scientific studies of the mummy conducted by University of Richmond undergraduate, Caroline Cobert, ’12, biology and classical civilization double major. The results of the studies are presented in the exhibition, along with some of the tools used in the scientific analyses and the three-dimensional CT (computerized tomography) images from Virginia Commonwealth University Medical Center. In September, members of the Scientific Society of Ancient Egypt "KeMeT" at the University of Warsaw Łukasz Przewłocki and Ewa Biskupek will begin a scientific project aimed at finding and documenting selected archaeological sites depicted in the nineteenth century drawings and described in the reports of the first archaeologists. Comparing them with the current state can provide new information on pioneering research conducted more than 150 years ago. At the moment, work is underway on searching, cataloguing and specifying, which monuments, primarily buildings, will be selected for detailed study. "Figures we are taking into account originate from the first half of the nineteenth century, and their authors are the first European Egyptologists, including Jean-Francois Champollion, Karl Richard Lepsius, Ippolito Rosellini, and about 200 scientists and 160 illustrators, who participated in Napoleon’s Egypt expedition" - explained Łukasz Przewłocki. Bonaparte's expedition was the cause of the immense work Description de l'Egypte. Thomas P. Campbell, Director of The Metropolitan Museum of Art, announced that distinguished curator, scholar, and archaeologist Dorothea Arnold will retire on June 30, following 21 years as head of the Department of Egyptian Art, including seven years most recently as its Lila Acheson Wallace Chairman. Her career at the Museum began in 1985. She will become Curator Emeritus as of July 1. Mr. Campbell announced further that the Metropolitan Museum will conduct an international search to appoint Dorothea Arnold’s successor. Diana Craig Patch, currently an Associate Curator in the department, will become Acting Associate Curator in Charge on July 1. Dozens of farmers in the Abu Simbel area have ended a sit-in and released 204 tourists they had held hostage inside their buses to demand the provision of irrigation water for their farms, Abu Simbel Mayor Assad Abdel Majid told ONA news agency Sunday. The farmers captured the tourists after they had visited the Ramses II and Nefertari temples, blocking the road in front of the Abu Simbel Temple. More than 2,500 acres had been planted since the beginning of the growing season and will be damaged due to a lack of irrigation water, the farmers had told Al-Masry Al-Youm.